"Wickedness will find a wide audience, appealing to those who like an historical thriller and those who can't get enough of the current preoccupation with the supernatural. What more could you want?" "In Wickedness, Deborah White brilliantly weaves past with the present." Two flame-haired girls, both fourteen years old and living in London, but four hundred years apart. A powerful and charismatic man. An Egyptian mummy and 20 spells written in hieroglyphics on parchment. An emerald casket, a gold ring and a rope walker. All are united by blood and by a devastating prophesy. Excerpts from Wickedness . . .
". . . the box didn’t magically open. Nothing happened at all. Except…She turned her head sharply. Caught the whisper of a scent; musty, acrid, sweet, seductive. And thought she could hear someone calling out her name. So convincing and compelling that she called out, “Yes? What is it?” her heart leaping up into her mouth as she waited for the reply. But there were no footsteps, there was no rustle of clothing, no answering voice. Only the soft tick, tick, tick of the bedside clock. And the distant sounds of life out on the street. A car. The nasal drone of a milk float. A dog barking. Familiar. Soothing. 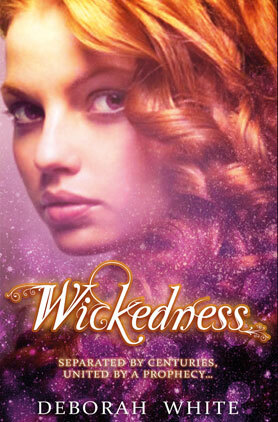 Click here to hear Deborah White's interview with Radio Leicester about Wickedness, as well as hear her read an excerpt. 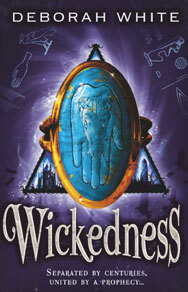 Left: The original cover of Wickedness when it was first published in September 2011.